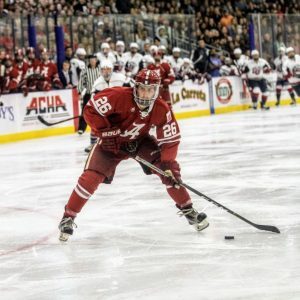 TUSCALOOSA, Ala. – University of Alabama hockey player Jonathan Lovorn wears the number “26” on his jersey during games. He also wears a sticker on the back of his helmet with a different name on it each game. The number 26 isn’t some randomly selected jersey number, and the stickers on the back of his helmet aren’t cute slogans or advertisements for products he likes. They’re both messages that have deep and personal meaning to him. Messages that he proudly serves as a billboard for so the whole world can see. Twenty-six is the number of people murdered by a mass school shooter at Sandy Hook Elementary School in Newtown, Connecticut on Dec. 14, 2012. Lovorn was a senior at Newtown High School at the time, and the tragedy had a deep impact on his life. He wears the number and the names so that people will never forget who the 20 children and six adults murdered that day were. Their lives mattered, and they were lost senselessly. “It’s been something that has been with me ever since it happened,” he said. “I’ve always wore a sticker on the back of my helmet that says, ‘never forget 12-14-12’ with a heart on it. I wanted to give back more than just that, and so I decided to change my number to 26 in respect to the 26 lives that were taken that day. “It’s all about giving back, and that’s something Newtown has really gotten behind – being kind and loving each other, doing things in your community to make a difference no matter how small that difference may be. 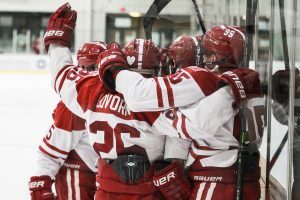 That’s really the message I wanted to take and use through the platform of hockey to reach other people. On the day of the shooting, Lovorn was in his sixth-period health class when the school went into lockdown. Hiding in a back room, Lovorn and his classmates sat between 15 and 30 minutes oblivious to the massacre that was occurring just 1.4 miles away at the elementary school. They were then dismissed to go to their next class, but the teachers couldn’t teach after they learned what happened at Sandy Hook. School was dismissed. “All the parents were in a panic, and you found out later that some parent’s kids wouldn’t be coming home. …The town held a candlelight vigil, and going to that was tough because nobody knew what to do, everybody just knew they wanted to be together. That feeling of helplessness followed Lovorn to the Capstone. Jonathan Lovorn and his teammates celebrate. He watched the documentary and was inspired. He decided at that moment to dedicate a game to a victim and their family through a green sticker on the back of his helmet with their names on it. It just so happened that there were exactly 26 games left in the season. Lovorn said it’s important that people understand that Newtown is not a city that’s been consumed by darkness. Since this tragedy, Newtown’s sons and daughters have gone out into the world bringing messages of change in hopes that a Sandy Hook will never happen again. “There’s people who graduated high school with myself who are working within the Legislature and doing things within Congress trying to make a difference to promote gun safety and responsible gun ownership, and that’s just the tip of the iceberg,” he said. “We do not want to see this become a reoccurring thing in American culture … we don’t want to let mass shootings have the same impact on their lives that it had on this town.